Married in Meghalaya: Feminist dream or the iron fist of matriarchy? Nobody in the wife's house cares about her husband. He feels like an outsider. He can't return to his parental house because his sister won't care for him. He feels lost. So many Khasi men feel like an outcasts. They become desperate," Keith Pariat told Firstpost, from Cherrapunji. Pariat is a building contractor by profession and the president of Syngkhong Rympei Thymmai ('a new hearth'). SRT aims to overthrow Meghalaya's matrilineal system. The organisation, which was founded in April 1990, in Shillong has taken upon itself to "liberate" men from female "dominance". The iron fist of matriliny? An exception in a predominantly patrilineal world, Khasi tradition dictates that property owned by a couple must be inherited by their youngest daughter so that she can take care of her brothers and parents. As per the norm, the youngest daughter's husband has to stay at her residence. "As per the matrilineal system, the younger daughter as the custodian of the property has to get her maternal uncle's permission to do anything with the property. This keeps the brothers and husband out," said Pariat. The maternal uncle in the Khasi system wields immense influence since the youngest daughter in a family, who is the custodian of property, has to consult with him on all issues. "But nowadays the maternal uncle stays with his own wife and is busy with his family. So the daughter keeps the property for herself without caring for her husband or brother," said Pariat. "Be it as a brother or as a husband, the position of men in the Khasi community is not at par with women." Not everyone believes that the old ways are in need of change. Esther Syiem, who heads the department of English at the North-Eastern Hill University in Shillong, says that Pariat's SRT is relevant since it highlights loopholes in the present system. But she warns against taking it too seriously. "But what is the strength of the SRT?" she asked. "Less than 2,000-odd urbanites against over a million plus. In the rural areas where the laws of marriage are strictly matrilineal, there is hardly anyone who would opt for a radical change to patriarchy. Change is inevitable but it cannot be drastic." Syiem points out the role that men have traditionally occupied in these societies and the cultural implications of those choices. "Changes will have to be take place but not at the cost of culture," she said. "The feeling of insecurity is definitely there among some men. But you have to understand that historically, men have always been the ones who were the decision makers of society. In that respect, they have never been or ever wanted to be associated with material wealth." Syiem says the culture evolved from the fact that women were considered the custodians of material wealth and keepers of ritual and religion. "In this day and age however, material wealth has taken precedence over everything else and the claims speak louder than the responsibilities. And so the complaints continue," she said. She also pointed to the fact that women aren't always the sole inheritors of property. "Among the War (a Khasi sub-tribe), property is being distributed among all the children, boys and girls,” she says. Not all men are opposed to the system either. "I believe in equality in the family as both parents play an important role in healthy development of their children. There is no question of anyone trying to subjugate the other," said Teilang J Marwein, who is Khasi but lives and works in Mumbai. Marwein believes that the patrilineal society is favourable only if a man is setting up a business, since establishing one in a matrilineal society is "next to impossible". But that's the only drawback that he sees. "The insecurity that some Khasi men have is more to do with their financial status and dependency on the wife or in-laws. Any financially independent person who can support and raise his family should not have an inferiority complex at all," he said. The Khasi community can take pride in the fact that no dowry system exists in its practices and it's also a community where women are comparatively freer than their counterparts in the rest of India. But though women have the right to property, it doesn't necessarily mean they are better off. Traditional burdens like child rearing are still there and ills of a patriarchal society like domestic violence remain prevalent despite matriliny. Domestic violence numbers are among the highest here, according to Syiem. Marriages are brittle in Meghalaya, and divorce and separation rates are very high. The 2011 census data revealed the state is second only to Mizoram in terms of its divorce rate. However, that has little to do with matriliny. "Our marriages break easily because we do not believe in the concept of doli (palanquin) to asthi (ashes). If there is any wrong against us, we are not afraid of walking out of the marriage...Our families always stand by us when we have to walk out of the marriage," said Jasmine Mawthoh (name changed), who hails from Shillong and works in Mumbai. Even if a couple that is separating has children, families are usually supportive. "Separation is accepted in Khasi society," said Syiem. "In the past, in the villages, the couple would announce their separation and the husband and wife went back to their parents. If the woman has children, her parents help her in raising the children." She says there are many single mothers and fathers in the community who faced no trouble while raising kids. "My own uncle brought up his children single-handedly. An extended family is one of the strengths of this society," Syiem said. Pariat believes that the old system is now being exploited by many non-Khasi men. "They [non-Khasi men] target the youngest daughter of a Khasi family to get the property indirectly," claimed the SRT head. "They even open businesses in their wives' names as we tribals don't have to pay income tax. They exploit the privileges given to us by the government. Many unassuming Khasi girls are falling into this trap." Marriage between Khasis and non-Khasis is nothing new. "Earlier when Khasi men married non-Khasi girls from the plains and came back to the hills, the girls were given a new surname involving the word 'khar'," said Mawthoh. "Surnames like Kharkongor, Kharumnuid, Kharbamon indicate that. 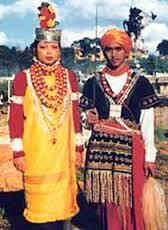 It is primarily a Niam Trai, or the indigenous Khasi tradition. This has been there for ages." Mawthoh herself is married to a non-Khasi and while she admits these inter-community marriages may be used for outsiders, it didn't mean a girl should be banished from the community as some organisations like the Khasi Students' Union demand. Syiem sees nothing wrong in cross-cultural marriages. She points out that it's not just the Khasi women, but the men too are doing so. "There are many women who have married men from the rest of the country and the world. I personally know many such couples who've actually settled here and vice-versa. Increasingly there are many men now marrying from other communities and bringing their wives here," said Syiem. Given almost every other community outside Meghalaya is a patrilineal one, its effects are being felt upon the Khasis' age-old tradition. "Once you stay outside Meghalaya, you are bound to be influenced by your surroundings,"says Faddey Nongkynrih (name changed), who teaches in Shillong and has been married for 15 years. "Following ways that are similar to patrilineal society is quite normal. For example, if the husband is earning and feeding his family in Mumbai, it is natural that he will have more say." While this doesn't usually affect the transfer of property within the state, it is making an impact upon the next generation. Nongkynrih says his own equations are good with his in-laws though he doesn't stay with them. The Khasi community is now at a point where it is trying its best to adapt to the practices of a patrilineal society without doing away with the matrilineal ones. "We are at a stage where there is a tug-of-war going on within society," said Pariat. "Even at my house, there is a tug-of-war between my wife and me. She wants the old system to continue, but I am against it. And this has been going in many families." He claims matriliny is a system whose time has ended. "We would prefer Khasis losing their uniqueness as matrilineal society than to go extinct. We want to join the mainstream of the world as a patrilineal community," he said. Others believe that the cost of such radical change will be far too high. "If our roots and culture collapse, I don't think we can survive for more than two or three generations at most and our identity would be lost forever," warned Marwein. But most believe that change, while inevitable, does not need to be either radical or destructive. "I find that people look upon the matrilineal society as a 'museum piece'," said Syiem. "The Khasis are being seen as following some ancient tradition that no longer fits into the modern world. But in a country like India, cultural hybridity is nothing new. We survive very happily, imbibing changes and making them part of our system. So changes at ground level happen, at their own pace."